Last night a Grand Jury failed to indict a Ferguson, Missouri police officer in the killing of Michael Brown. The Grand Jury found that the officer followed proper police procedure in shooting Brown six times. Mr. Brown age 18 was unarmed. A few days ago a 12-year-old boy in Cleveland was shot twice in the torso and killed. It was found that the boy (name currently withheld) was carrying an air gun. 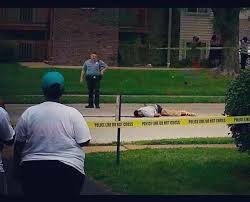 Both Michael Brown and the 12-year-old were African-Americans reinforcing a fear of many black parents that their sons are targeted by police for arrest and shootings at a rate far higher than other racial groups. According to a ProPublica analysis of federally collected data on fatal police shootings of young black males in recent years, were at a far greater risk of being shot dead by police than their white counterparts – 21 times greater. Imagine yourself as the parent of an African-American male and worrying for the safety of your child. I’m particularly concerned about the protocols taken as a given for police as to when to use deadly force. It is jarring to hear authorities calling for restraint on the part of an outraged populace in places like Ferguson while police protocols sanction the shooting six times of an unarmed Michael Brown. In my opinion what is needed is a nationwide debate as to the use of violence to resolve differences. What is needed is an acknowledgment that the age-old model of violence being met by violence does not work, indeed it has always led to only more violence. Imagine a day when police officers are trained in primarily non-lethal ways of defusing tensions and enforcing laws. Imagine a day when enraged citizens don’t feel the need to burn stores and overturn cars but rather are trained as Dr. King taught in non-violent civil disobedience. Dr. King spoke these words 51 years ago. The high rate of incarceration of African-American males and the high rate of police shootings tell us that we as a nation still have a racial problem. My hope and prayer is that this controversy in Ferguson will lead to a renewed debate about how police are trained to defuse tensions and serve their community. What we do know is violence, sanctioned by the state or arising from an outraged community only leads to more violence. Can we imagine a world where hate is met by love? Your points about improving the opportunity for non-violent resolution of problems are well taken, but until people learn to take responsibility for their actions I think they fail to recognize reality. Police calling for restraint is precisely the practice you desire, the use of non-violence. Police departments rely on Use of Force policies. These policies serve to delineate the conditions under which force, up to an including deadly force, can be used. There is no magic formula. Much as been made of the physical size of Mr. Brown, 6’5″ 285 lbs. In reality, the old adage about “it is not the size of the man in the fight it is the size of the fight in the man” that really matters. Having spent 20 years on a Police department, I’ve seen some very small people put up very big fights. As a young officer I learned that every call I went on involved a weapon, specifically a firearm. IN most cases, it was the one I carried into the scene. If I lost control of that weapon, it would be a deadly error. While the death of anyone at the hands of the police is tragic, the actions of the involved person is often overlooked. There are certain aspects of this case that are now known to be factually true, but were distorted in the original media frenzy. 2. Mr. Brown assaulted Officer Wilson, after Wilson recognized him from the robbery, and tried to get his weapon. 4. Mr. Brown initiated the violent confrontation and escalated it. With that said, I am certain that racial prejudice is alive and well in this country. There is no doubt people of color are at a much higher risk of being stopped by the police. There is no doubt that officers raise the confrontational level with people of color at a higher rate. And that is precisely why all of us, particularly people of color, need to avoid such confrontational conditions. Do what the nice policeman tells you, then use the power of the court to reconcile any unlawful acts by the police. The reality of the street is there is no right, nor is it the place, to argue with the police on the street. That is what the court is for. Now, the bigger issue in this country is the lack of equal protection under the law, primarily related to economics. If Mr. Brown had submitted to the arrest, he most likely would not have had access to the best legal advice. He couldn’t afford it. All one has to do is look at the OJ Simpson case to see the evidence of that aspect. I am not one for the idea of people looking down from heaven, but assuming for the moment Dr. King is in fact looking at Ferguson or anywhere else violence is being used as a venue for protest, he would be wondering how all his good work went to waste. Joe, thoughtful comments and well said. Most of the police I’ve worked with as a volunteer chaplain for several years are able to do a very tough and complex job with restraint and compassion. I’ve written several letters of commendation to the chief of the community I served in for 20 years in Oregon recognizing the good work of his officers. But what is true and what you acknowledge as well as there remains a racial problem and for many of my African American friends a deep distrust that the judicial system will give them a fair hearing, whether it be in Ferguson or other places in our nation. All that frustration gets painted with a broad brush on police officers, those who practice good policing and those who don’t. Joe, thanks for your service and look forward to reconnecting in person sometime soon.